Here we have for sale - an 1891 Original Paperback , 28th Edition. This is a really hard year to find in original form and in nice condition. We have sold under half a dozen since 2008. 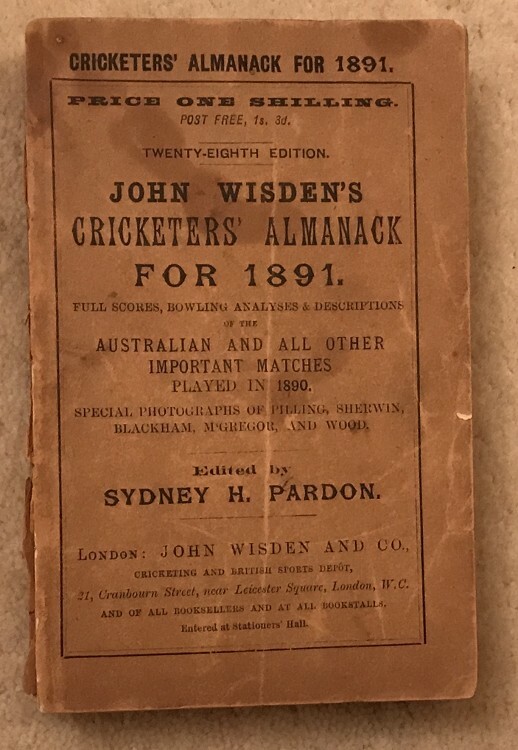 The covers on this Wisden are pretty dark and marked with odd nick to the edges , the spine paper is 100% original but flaking away at one end. Still tightly bound. There is quite a alot of spotting, mainly around the photoplate , which is a touch loose. A hard year to find. Postage - Free via special delivery to UK, £10 elsewhere. Payment Details: Card, Paypal, BACS or Cheque.